1) Are you interested in becoming better? 2) Are you always looking for that edge that will make you look better, feel better and perform better in and out of the gym? 3) Are you interested in discovering a simple to follow, done for you system that will teach you EXACTLY what you need to do in order to turn your typical pre-workout routine into a MASSIVE, result producing warm up to increase your strength, flexibility, mobility, balance and coordination? …You’re happy with your current level of strength, if you have all the flexibility you’ll ever need, if you can walk on your hands easily and have perfect balance, or if you have a warm up you already use that is getting you awesome results. If this is you, then read NO more, because this system only works for people who seriously want to build super strength and flexibility in their spare time, not for people who are only mildly interested in becoming true physical specimens. As the years went on I had the privilege of training with some of the top performance experts in the fitness industry. I have literally spent over $20,000 to learn the secrets that these people know that allows their athletes to become not only strong and powerful, but also to build and maintain their flexibility, balance and coordination which makes them not only perform better, but less likely to get injured. I took these secrets and began applying them to my training and within a few months people were amazed at what I was capable of doing. This made me realize that there was a good amount of strong people out there and a good amount of flexible people out there but very few people who were both strong and flexible. I couldn’t help but think to myself, “don’t these yogi’s also want to get strong?” and, “don’t these power lifters and bodybuilders want to be flexible and move well?” After all why have world-class strength if you can’t tie your shoe, and why have world-class flexibility if you cant pick up your own bodyweight? Why not aim for both, right? I took the methods that I learned and organized them into a system that was initially only taught to 7 of my private clients who were very interested in acquiring the “Unbelievable Strength And Flexibility” that I had developed. Needless to say, they were amazed at the results they were getting from adding this short routine into their workouts for only 15 minutes 3 times a week. Finally I decided to put my routine which I call the Warrior Warm Up into a step by step, easy to follow ebook and video series that will teach you the exact exercises in the exact order that will take you from tight, immobile and uncoordinated and show you how to acquire the strength and balance of a gymnast and the flexibility and coordination of a yogi in the 15 minutes you usually spend warming up. 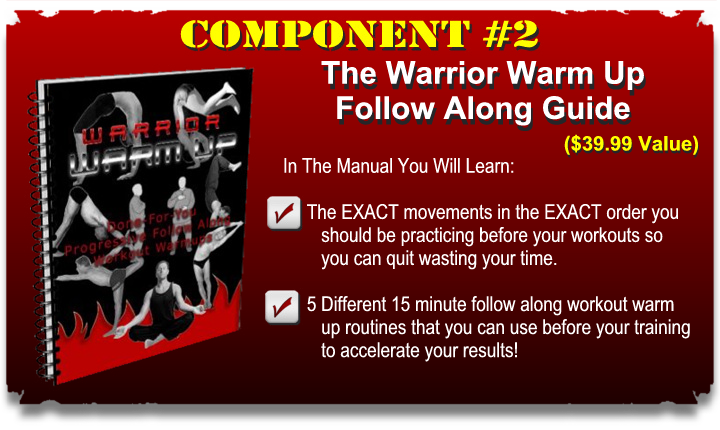 The real secret to why the Warrior Warm Up works so well isn’t that it replaces all of the systems listed above but that it combines them. This way, you develop several different skills all at once. I’ve not only created over a dozen ebooks and videos that show you the EXACT PROGRESSIONS that you need to do, but as a special promotion if you order today you will receive 5 FREE BONUSES that you can use to accelerate your results even further!! IN ADDITION TO ALL OF COMPONENTS ABOVE YOU ALSO GET THESE 5 BONUS FOLLOW ALONG VIDEOS FREE!!! By now, you may be asking yourself how much a comprehensive system like this could be worth,… $100, $200, maybe even $300? Truth is… it will cost you a lot more (much more) to learn about all of these secrets by spending years and years going to seminars and classes just to find them yourself. Like I said before I have spent over $20,000 and traveled around the world to learn from some of the brightest minds in the fitness industry… and that was just on training alone! 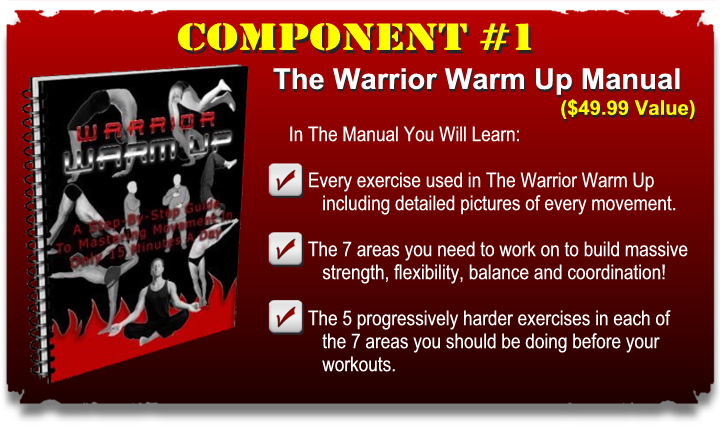 If, by following the Warrior Warm Up, you are able to achieve serious gains in your strength, flexibility, mobility, balance and coordination, you will have saved $10’s of thousands of dollars and years of trial and error trying to figure out EXACTLY what works! Better Yet… even if you could afford to train with all of the people that I learned from (usually spending $2500-$4000 per trip) you would have a hard time finding one that is capable of performing or understanding the system I created. This is because it took me years to build a system that gives you results like the ones you will receive from following the Warrior Warm Up! 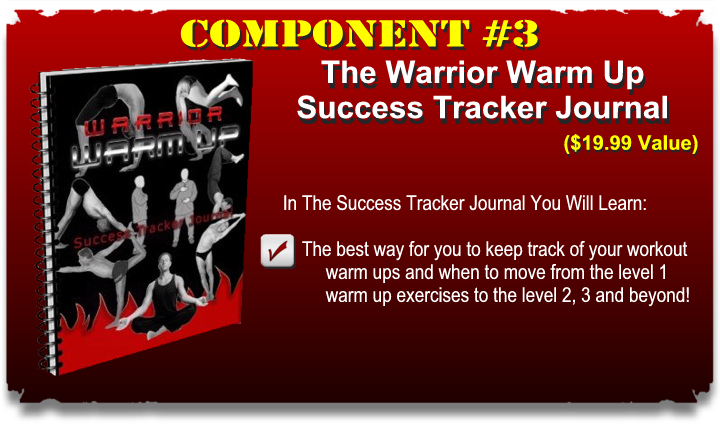 After the timer below hits ZERO, I’m officially retiring The Warrior Warm Up System and you will no longer be able to get your hands on it, NOT FOR ANY PRICE. So… You officially have until the clock hit’s ZERO to get your hands on The Warrior Warm Up System before it’s gone for good! I urge you not to put this off. 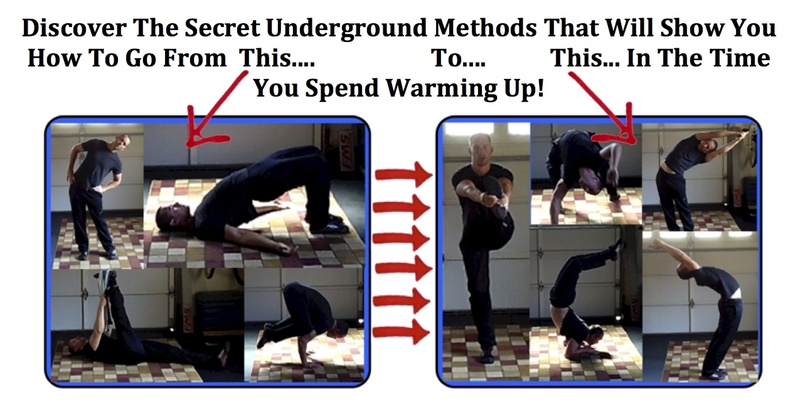 This is your last and final chance to get your hands on my Warm Up Secrets. So…I urge you to start using the Warrior Warm Up System today.